Description: This pusher set has completed its task of assisting a northbound coal train to Belden tunnel. It now cuts off and runs back to Binghamton for another shove. Description: RPPY rolls into East Binghamton. The train will be classified here, and sent south. Often, NS and CSX power ran through from Potomac yard, and would take the train south. 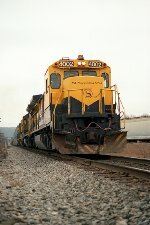 Description: A westbound MTPL rolls back to the mines in western PA behind a B 40/F 45 combination, seen at East Corning. Description: Going away shot of a PLMT coal train headed for East Binghamton shows an eclectic mix of power. Description: Among the as needed moves were coal trains to a power plant in Mt Tom, Mass. These originated on the P&LE, and sometimes the power ran through. A lot of times, it came in with a variety of D&H or NYSW power, along with whatever CSX had to assist. One such train arrives at BD with an NYSW B 40 leading a pair of CSX units and a leaser. Description: An early stack train heads eastbound past ZINC with the 4002 leading. Photo by my father Jim. Date is approximate. Description: This field in Owego was a favorite vantage point. There was a good, open view of the tracks, and the crops changed periodically, so it was always a new view from season to season, and year to year. Heres MEBU with a pair of GEs bracketing one of NRLs F 45s. How about that Rio Grande auto rack head out?? Description: On the roster shot of 3614 in the yard, I mentioned that NYSW power would show up anywhere, and here is proof-a pair of units, an SD 45 and a B40, lead BUME at Bevier St. Description: NYSW and NS power leads SLN 5, symboled DHT 9 on Conrail, past the rocks just east of CP East Glass. This is the approximate location where the DLW and Erie joined going east, with the DLW trains taking the Erie from here to Binghamton after 1959. 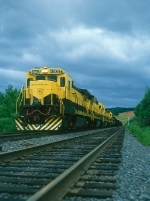 The DLW was abandoned from here to the west side of Binghamton, except for short segments in Elmira, and from Waverly to Nichols to serve an Agway there. That section was abandoned in 1965. If you know where to look when you're on NY 17 east, you can see vestiges of the right of way near Elmira and Wilawanna; there were still some bridges near Lounsberry, and the Apalachin station still stands. It's a Subway and ice cream shop. Description: SLN 5 has changed to a D&H crew and is underway from Binghamton, just departing the office. The train is well powered with a B 40 and five NS units. It will be a good chase to Hornell. Description: SLN 5 rolls west behind a B40 and five NS units, coming down the long(for the Tier) tangent as it approaches the CR 119 overpass at Carson. Description: SLN 5 rolls out of the Canisteo valley at Carson, knocking down the clear board on signal 325-1 as it approaches Hornell. Description: SLN 5 rolls along NY 417 between Gang Mills and Erwins as it approaches the Canisteo valley. Description: The railroad passes along the back side of the buildings on Waverlys main drag, and the look is very much like a model layout. This has long been one of my favorite shots. Description: SLN 5 passes the Tioga County transfer station, and also one of the many semaphores then still working on the Tier. This is signal 249-1. Description: SLN 5 rolls through the twin semaphores at MP 243-actually, they are 242-1 and 242-2, they were just east of MP 243-knocking down the signal on track 1. This was probably the most popular shot on the Tier west of Binghamton. Easy to get to, and couldnt beat a pair of blades side by side. Description: NY 10 rolls into Great Bend, having just crossed the NY-PA state line. It will cross several more times between here and Mill Rift, where it gets out of PA for good. 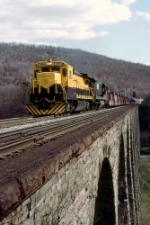 Description: A shot from across the valley, in Oakland PA, of Starrucca Viaduct and an NY 10 rolling east.